10+ Best Free SEO Tools. Full Information. Home10+ Best Free SEO Tools.10+ Best Free SEO Tools. Full Information. Do you want to rank your website higher on the google but you are bot able to analyse your website to know the defects of your website and you can improve your website's SEO, then don't worry friends we have a solution for you today we are going to tell you about 10+ Best Free SEO Tools. 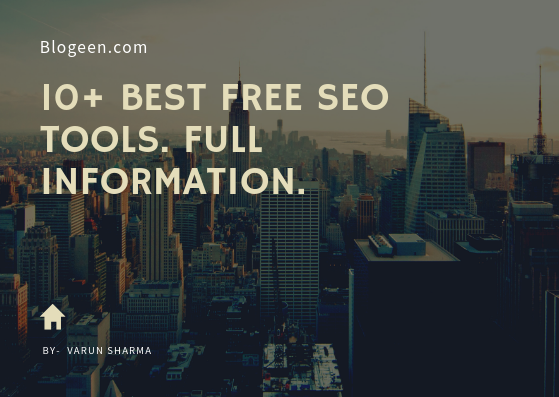 Hello friends my name is Varun Sharma and today I am going to tell you 10+ Best Free SEO Tools. Friends these seo tools that I am going to tell you will help you to improve your website's SEO and you can easily rank your website on the google. To become a successful blogger you have to check mistakes in your website so you can correct them and this can be possible by only Seo Tools. Technical SEO Tools: Friends first of all we will talk about technical error tools friends using these tools you can solve technical errors of your website. Friends this is all in one SEO tool and one of my favorite tool using this tool you can analyse your website and you can solve errors of your website.So lets see it's features. 1) Using this tool you can create sitemap of your website. 2) Using this tool you can check your website's meta description, title, keywords, etc. and it will tell you on which page your seo settings are not proper. 3) Using this tools you can analyse your heading tag. 4) You can check image alt tag. 5) Using this tool you can find several types of errors such as Redirect, Not Found, etc. 6) You can check internal link of your. 7) You can check Internal Duplicate title and description. 8) You can create report and import it in excel. 9)You can check external link of your website. As I have told you in some of my previous posts that your website's speed should be good.It will help you to rank your website. So google launch Pagespeed Insights to help webmaster.Using this tool you can check your website's loading speed for mobile and desktop.It will give you some suggestions or tips to increase loading speed.With the help of these tips you can increase website's loading speed. It is another google's tool this tool help you to know that is your website is mobile friendly or not.It is a cool tool if your site is not mobile friendly it will give you some tips to make your site mobile friendly. It is an awesome tools using this tool you can create sitemap of 500 posts for free. 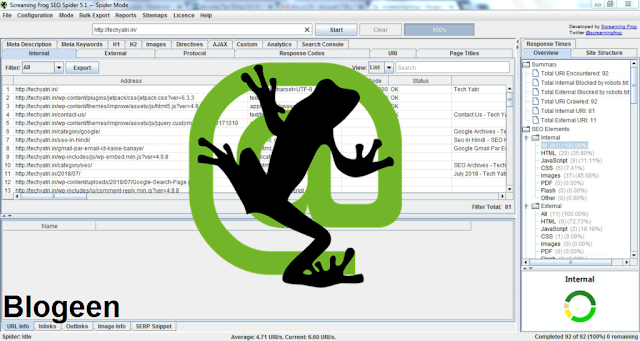 This tool help you to increase loading speed of website. If you use external service like web push or popups slowdown the speed of your website. By using there script loading time of your website will increase.It is also a good tool because by increasing website speed visitors will get engage on your website it will improve your bounce rate, and good thing is it is totally free. If write on the topic of writing review on something, or cooking blog then you need structured data to add review and rating. Then google launched Structured Data Testing Tool for these type of bloggers. You can test and schema on this tool and what is the mistake in your schema. This tool will help you to improve the speed of your website. First it will analyse your website and then it will give you some tips or suggestions to increase speed of your website and are able to increase the loading speed. "Keyword Research Tools": Now we tell you about keyword recherche tools. Friends keyword is the backbone of SEO if you know how to play with keywords then no one can stop your website to rank higher on the google.So lets start. Friends this is my favourite tool an it is an awesome tool but it is not completely free you have to pay for it to get its all services. With the help of this tool you can check the competition of a keyword in any country.You can also search most popular keywords on the on google using this tool. It is very help full tool. It is a cool tool form google you can search all information about a keyword using this tool you can get information a keyword's competition, its bid and its volume and you can see the popularity of a keyword and after good keyword research you can choose a good keyword and use it in your blog. It is also another SEO Keyword Research tool but in this tool you can check competition of a keyword means it tells you how difficult to rank your blog on this post. Traffic and Technical Analysis: Now its time to talk about some tools that analyse traffic on your blog friends it is very important for you to know that how much traffic coming on your website, and from which source traffic is coming. It is also a Seo tool from google. Using this tool you can check the traffic of your website you have to add a property in this tool and it is a very helpful tool for all the bloggers and it tells you your site's traffic data and from which source it is coming and you can focus on that source, it tells you from which country your traffic is coming , it tells you how much time visitors spending on you blog, you can see the real time visitors on your blog, you can see which post have most views. It is also a free tool from google it is a very good seo tool google launch this tool to help to help the google webmaster.So lets see its features. 1) You can submit create and submit sitemap from google search console. 2) You can see your which of your posts are indexed. 3) You can check backlinks and internal links of your website, etc. Conclusion: Hey friends I hope you like our post 10+ Best Free SEO Tools. Friends if you like our post then please share our post because sharing is caring, and if you have any type of question or problem then please comment we feel happy to help you. 10+ Best Free SEO Tools. Easy Ways To Get Quality Backlinks For Your Blog/Websites SEO Free. 100+ Best Web 2.0 Sites list. Top 10 Google Ranking Factor For Beginners. Top 8 Ways To Make Money Online In India. How To Change WordPress Default Login URL. How To Write SEO Friendly Article?